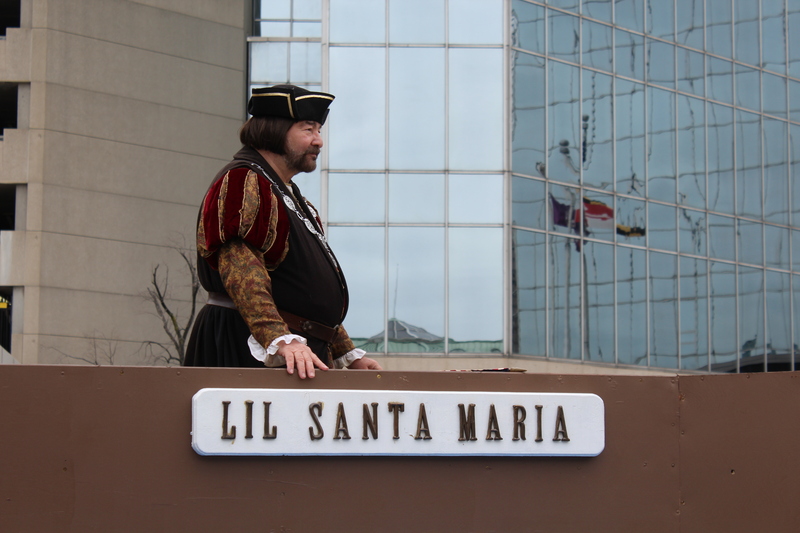 Captain John Smith here reporting on the latest movement of Still Waters II. The weather finally cleared and our crew has set off for Philadelphia. 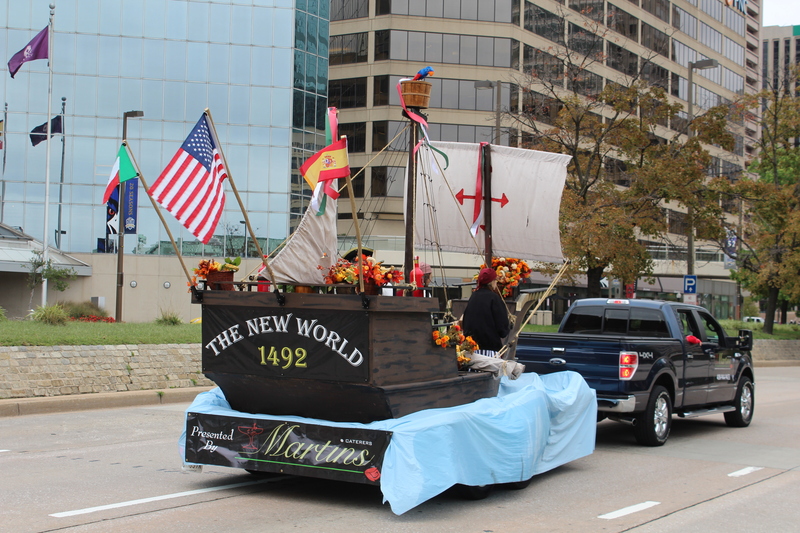 Just so happened that the Little Italy Community sponsored the 125th consecutive Columbus Day Parade at 1400 on Sunday. The crew decided to stick around the parade route and enjoy the festivities. 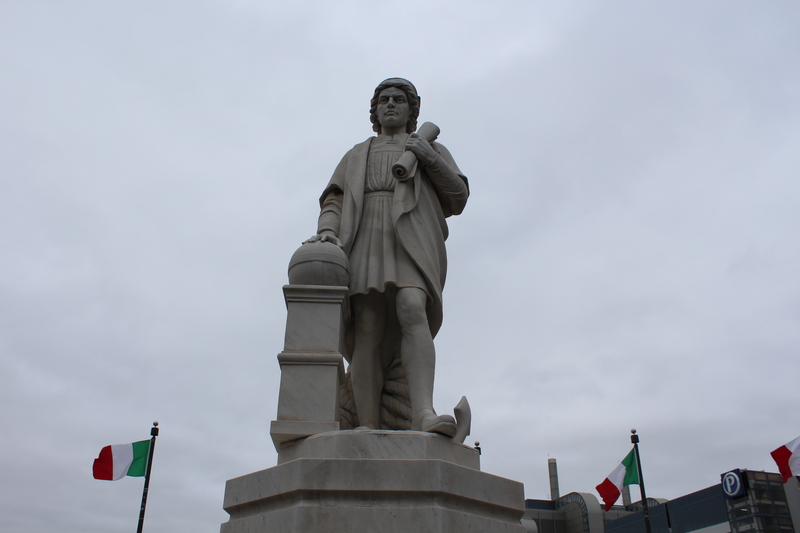 Christopher decided to join our crew and take the ride up to Philadelphia. This allowed me to jump ship in Havre de Grace near the last interpretive buoy at the Susquehanna River. When I first navigated these waters back in the summer of 1608 I discovered that the river could only be navigated upstream for about five miles before running into rapids. So much for the elusive Northwest Passage. We left the river and started exploring back towards the east for a way back into the Atlantic Ocean. We did not find a way to the Atlantic back in 1608. However, I promised a couple of Indian Chiefs that I would return the following year and never did. So I will take a leave of absence to go find my old indian buddies. 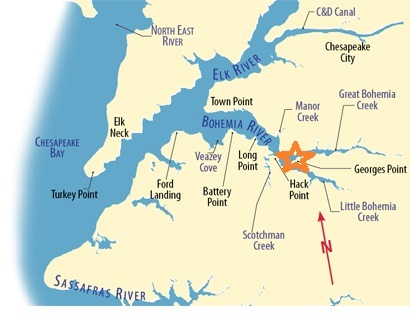 While here, I will also explore the 14 mile Chesapeake and Delaware Canal. The canal links the Bay with the Delaware River. 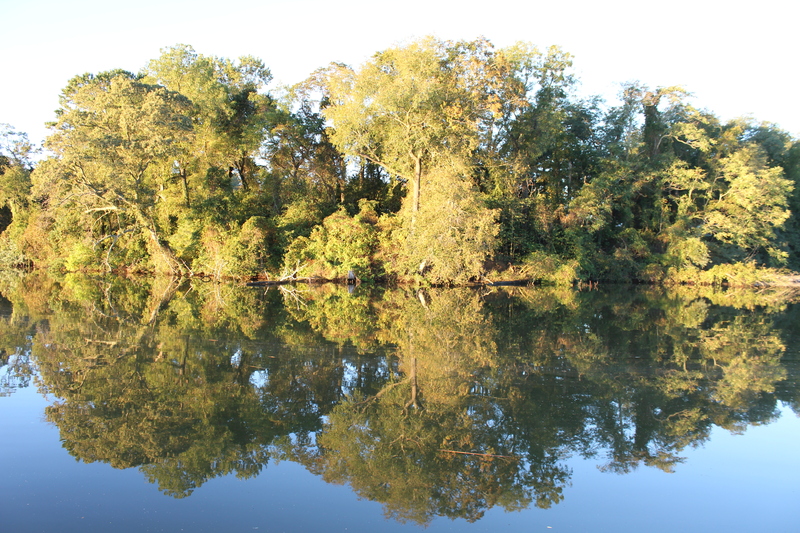 When the canal opened in 1829, it shaved 300 miles off of the water route from Baltimore to Philadelphia. On Monday night the crew anchored in the Bohemia River. The recent cool weather has started the fall color change and the ride up was very picturesque. 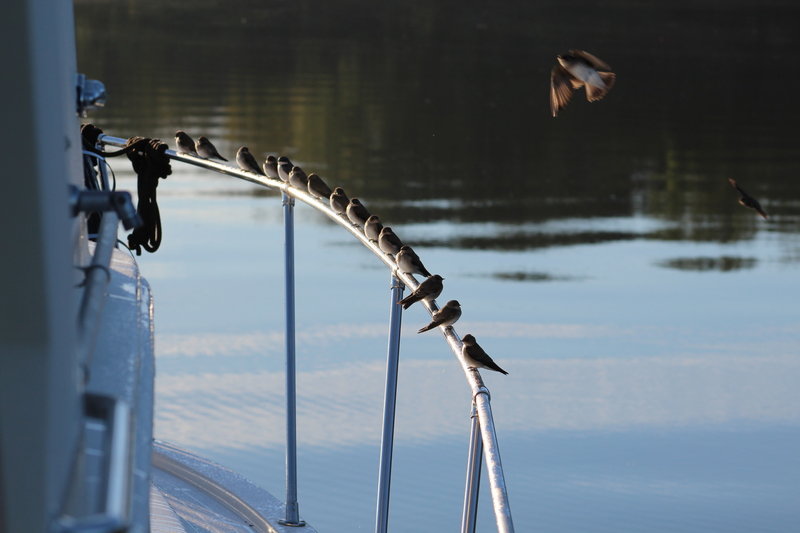 The next morning the crew was surprised to see a flock of birds using the handrails for free perching. While trying to get pictures of these birds, the skipper noticed two bald eagles flying in the distance. The eagles flew directly over the boat and landed in a nearby tree. 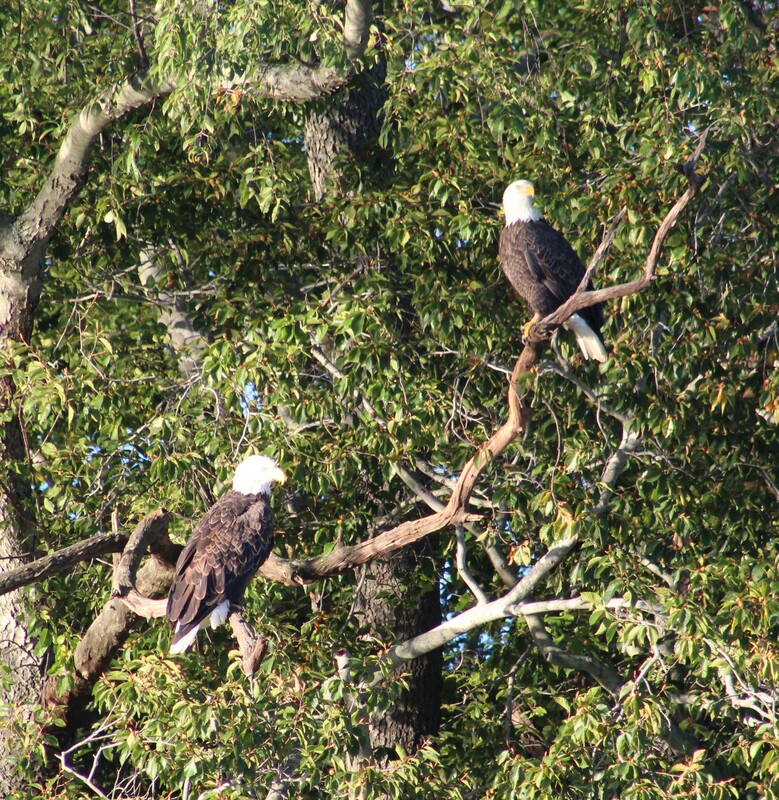 The eagles stayed in the tree until the crew was ready to weigh anchor. The crew dropped me off near Havre de Grace, so I will have Christopher narrate the rest of the travels to Philly in a subsequent log entry. Havre de Grace, Maryland was the runner up location for the new District of Columbia back in the late 1780’s. The Constitution specified for a District to be set apart separate from any state of the new government; however, the Constitution did not specify a location. Maryland, New Jersey, New York, and Virginia all offered territory for the new Capital. A compromise between Alexander Hamilton, James Madison, and Thomas Jefferson secured a southern location for the federal capital. The compromise was around the paying off of Revolutionary War debts of the individual states. The southern states had mostly paid their debts to Spain and France while the northern states were falling into delinquency. The federal government agreed to pay the remaining war debt for all states, which meant the south’s taxes would help pay the north’s debt. In return, the capital would be built in the south. Washington was selected as the location and Havre de Grace slipped into obscurity.